The old saying that blood is thicker than water is strikingly exemplified in the char­acter of Gen. King. And it is scarcely pos­sible to understand his individuality or to account for the remarkable versatility of his gifts without a glance at the sturdy Ameri­can stock from which he is descended. His great-grandfather was Hon. Rufus King, one of the first of the distinguished line of statesmen which New York has sent to the United States Senate. The name of this ancestor of the soldier-author is signed to the Constitution, and his services in assisting to frame that historic docu­ment, and in shaping the destinies of New York State from the foundation of that com­monwealth, were recognized by the highest gifts which the Empire State could bestow. He was twice selected as Minister of the United States to England. Charles King, grandfather of the subject of this sketch, was one of the earliest presidents of Colum­bia College, and recognized as a bright scholar of rare intellectual gifts and attain­ments. In the father of Gen. King were found the military and the scholarly traits which obtain in his son, for Rufus King, the sec­ond, was both a military and an intellectual leader. His rare qualifications in the latter field were recognized by his appointment as Minister to the Pontifical States at Rome, a position demanding peculiar endowments of personal tact, poise and grace, together with ripe culture and a broad knowledge of affairs. On the occasion of his departure for this important post the Civil War broke out. Mr. King immediately resigned his appointment and retraced his steps to Wis­consin, where he assisted in the organiza­tion of Wisconsin's Brigade. He was among the first of President Lincoln's appointments as Brigadier-General. He was also proprietor and editor of the Milwaukee Sentinel, and wielded a strong influence in the politics of Wisconsin. The great Indian apostle, John Eliot, was the head, in America, of the distinguished fam­ily of which Gen. Charles King's mother was a member. The home of Gen. King, during the ab­sence of his wife and children in Europe, is at the old Eliot mansion in one of the most beautiful streets of the Cream City. With so remarkable an ancestry, it does not ap­pear strange that Gen. King has reached a high place as soldier, author and scholar. His first plunge into soldier life was made when a lad of sixteen years. He had been in New York City in attendance at the prep­aratory or grammar school connected with Columbia College, and had just passed his examination admitting him to the latter institution, when the whole country was thrilled by the echo of the guns at Fort Sumter. Instantly his dreams of college days were forgotten, and before another day had passed, after the Union troops had begun to assemble in Washington, his soldier blood was bounding in his veins and he was on his way to the Capitol city. There his father's old friends from the Badger State were surprised to greet the face of the boy in the camp of the Wisconsin volunteers. It was plain to these veterans that the lad had not come from idle curiosity, for his drumsticks were in his hand and his fingers itching to play the reveille. This accomplishment immediately gave him place and standing in the regiment, and he was kept busy for some time instructing others in the use of the drumstick. He speedily became a favorite at head­quarters and was promoted, in spite of his extreme youth, to the position of mounted orderly, and began his active career as a soldier under Gen. Winfield Scott Hancock in Virginia. In the course of this service the lad's abilities were brought to the personal attention of President Lincoln, who gave his promise that the boy should be given a cadetship at West Point. In pursuance of this pledge he was sent to the United States Military Academy at West Point, in June, 1862, was made first Sergeant of Company B two years later and Adjutant of the Corps of Cadets in 1865. An old companion has said of him, that in those days of his training he was distinguished by his sunny temper and the fact that, contrary to the prevailing usages of the school, he never failed to have a good word for the down-trodden "plebe," and that he hated mathematics as ardently as he loved rollicking fun and reckless sport. It is evident however, that he must have mastered his dislike for mathematics, as he was graduated with the rank of Number 22 in a class of more than forty members. Only one of his classmates has thus far won notable distinction. This was the brave William Preston Dixon, who lost his life in an attempt to save a helpless woman at the time the steamer Evening Star went down. Until 1866 he remained at West Point in the capacity of instructor in artillery. He left this position to become attached to Bat­tery K of the light artillery stationed at New Orleans. His next remove was to Fort Hamilton, in connection with Battery C. Then he was recalled to West Point to instruct future officers in the mysteries of horsemanship and cavalry and artillery tactics. In 1871 he was appointed Aide-de-Camp to General Emory, from which he was transferred to Troop K of the Fifth Cavalry, which was then being removed from Fort D. A. Russel in Wyoming, to Camp Hualpai, Arizona. How great a part his stay in New Orleans on staff duty was to play in his life he little knew, when he accepted the trans­fer as an incident in the uncertainties of military life. It is now almost impossible to realize the social ostracism to which officers of the Federal Army were then sub­jected in the gay old city of the South. His engaging manners, however, were sufficient to win for him a circle of select friends with whom he was well content. Among these was the daughter of a South­ern gentleman, Capt. Yorke, of Carroll Par­ish, Louisiana. They had not long been ac­quainted when the young officer learned that ­no representative of the American army had entered the great international race which was each year the star event at the old Metairie track. This opportunity appealed to his patriotism, and he instantly decided to become the defender in the contest of the United States Army. His opponents were Count Victor Crenneville, of the Austrian Hussars, Mr. Stuart, of England, Captain Rosenlacher, of France, and Mr. Ross,' late of the Inniskillien Dragoons, who rode for Ireland. The prize was a beautiful gold- mounted riding whip, but the young Yankee lieutenant determined to make the race for a greater stake than any of the spectators knew. From thousands of parasols in the gay assemblage fluttered the scarlet and white colors of Austria, the red and blue of Eng­land, and the green of Ireland, but the sky-blue and white ribbons which Lieutenant King wore in honor of Columbia were not to be found in the whole concourse, save by the most diligent search. Only two of the spectators, the wife of Gen. Emory and Miss Yorke, had the pluck to fly the colors of the American contestant. But races are not won with ribbons, and at the end of the homestretch Lieut. King's horse was the winner by two lengths. 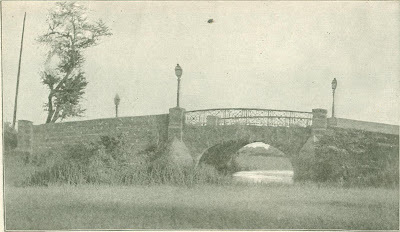 And he did not fail of his larger stake, for he placed the whip in the lap of the girl from Carroll Parish, who became his wife before the succeeding winter—a season which brought turbulent scenes to the quaint old Southern city which was rent with riots that gave the young officer severe and diffi­cult training. His next, move was an important one, and afforded him his introduction to the perils and hardships of frontier Indian warfare. 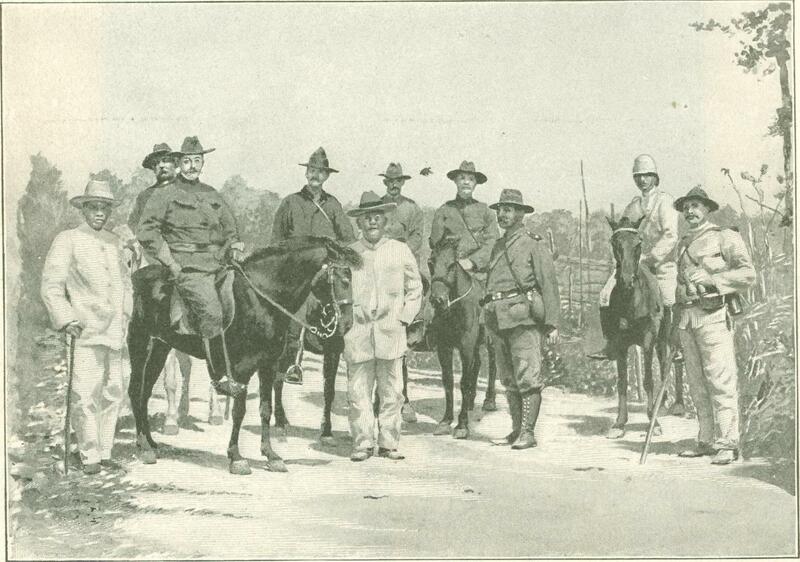 He was assigned to the Fifth Cavalry in com­mand of Troop K, which did heroic service against the Apaches, a tribe which sus­tained its reputation for cruelty, cunning and courage. In these desperate encounters he displayed the coolness and indifference to danger which have uniformly characterized his entire military career. In the fight at Diamond Butte, May 25, 1874, his bravery was so conspicuous that his recommendation for promotion to the rank of captain was made by the command­ing general. 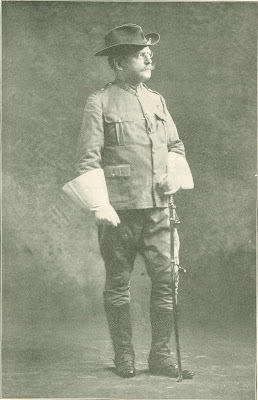 It was a marvel to his com­rades that he came out of one fight after another without a scratch, for no private in the ranks exposed himself more persistently to the enemy than did the leader of Troop K.
There were many doleful prophecies that this exemption from Apache bullets could not continue indefinitely, and the historic fight of Sunset Pass, November 1, 1874, ful­filled these unhappy predictions. In the midst of the encounter Lieutenant King found himself and Sergeant Bernard Taylor cut off from his troopers and the center of a wicked fire from the Apaches. It is not improbable that this country would have missed one of its most entertaining and typically American novelists, had not a naked savage, hiding behind a rock, sent a well-aimed bullet into the body of Lieuten­ant King. His right arm was shattered and he gave peremptory orders to Sergeant Taylor to leave him to his fate and save himself. This command the plucky Sergeant deliber­ately refused to obey, and standing over the body of his fallen lieutenant, Taylor fought back the Apache until a detachment of troopers came to the rescue. The wound healed sufficiently to permit him to engage in the celebrated Big Horn and Yellowstone expedition, in which he added materially to his laurels, and was rewarded by Gen. Wesley Merritt by appointment as adjutant of the regiment. A year later, in the spring of 1877, he was again in the thick of the Big Horn cam­paign, and was later called to the scene of the railroad riots in Council Bluffs and Chi­cago. His next experiences were in connection with the Nez Perces uprising. This was fol­lowed by more severe mountain scouting in 1878; by this time he had attained the rank of Captain, and was in command of A Troop. The old wound received at Sunset Pass had, in time, given him constant and increasing trouble, and at length became so serious that in June, 1879, it compelled him to appear before the retiring board for permis­sion to relinquish his active military career. This petition was regretfully complied with, and he retired from the service and returned to his home in Wisconsin. His knowledge of military affairs brought him an appointment as instructor in the University of Wisconsin at Madison. 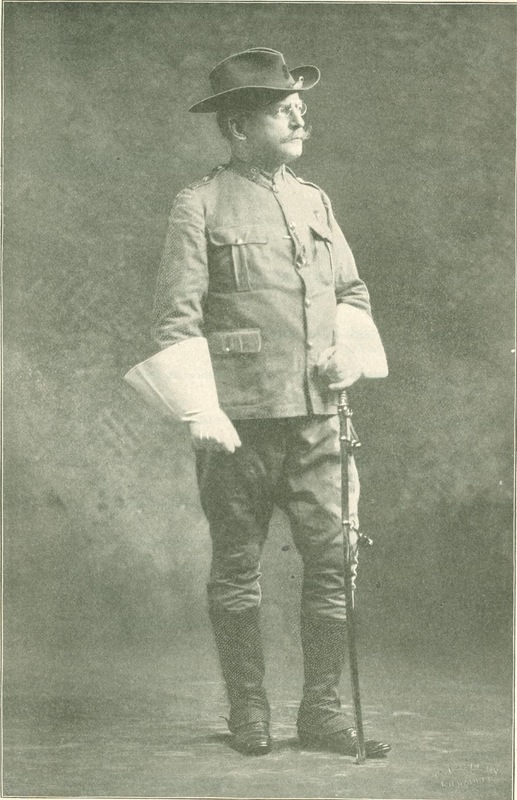 He was also selected by Governor Jeremiah Rusk to act as Colonel and Aide-de-Camp in the state military organization. In 1895 he was appointed Adjutant-Gen­eral of Wisconsin, and in that capacity did much to raise the militia of that state to its present high standard. The outbreak of the war with Spain in 1898 found him in better health than he had enjoyed for many years, and stirred his soldier blood as deeply as did the first call for volunteers in '61. May 28th of last year brought him his appointment as Brigadier-General of Volunteers. He was ordered, June 2d, to report to Gen. Mer­ritt, in San Francisco, and left for that city two days later, taking immediate departure for the Philippines, where he commanded the men of the First Washington, First California and First Idaho regiments. 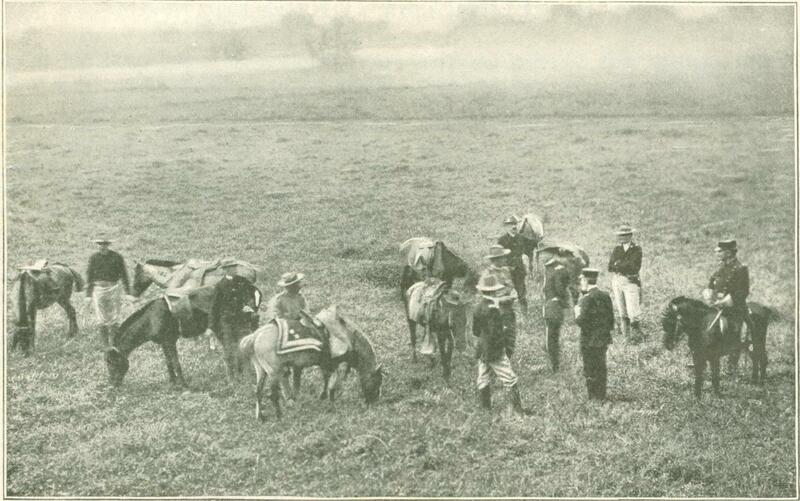 Gen. King confesses that he was never so happy in his life as when leading these men against the Filipinos. His only re­gret is that the return of ill health com­pelled his voluntary retirement June 1st of this year. 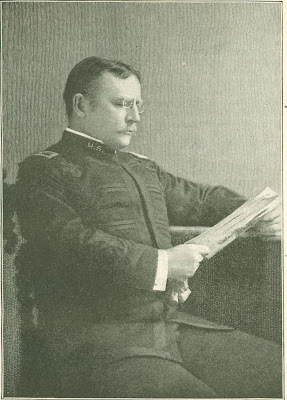 When chatting with callers, in his dingy room on the third story of one of the oldest office buildings in Milwaukee, Gen. King resolutely refuses to be entrapped into a literary conversation, and invariably returns with soldierly enthusiasm to the topic of the war in the Philippines, and grows eloquent in the praise of the conduct of his "boys" from the Northwest. Many of the latter, however, have brought back stories of their commander more enthusias­tic, if possible, than those which he relates of them. They tell of how he thrice passed at the head of a portion of his command over a certain bridge which marked the division between the American and the Filipino forces. How great is the marvel that he came out of the engagement un­touched, is best indicated by a photograph which the writer found lying on his desk, and which is published in connection with this article. A glance at this picture will show that the side of the structure is literally pitted by bullet marks. 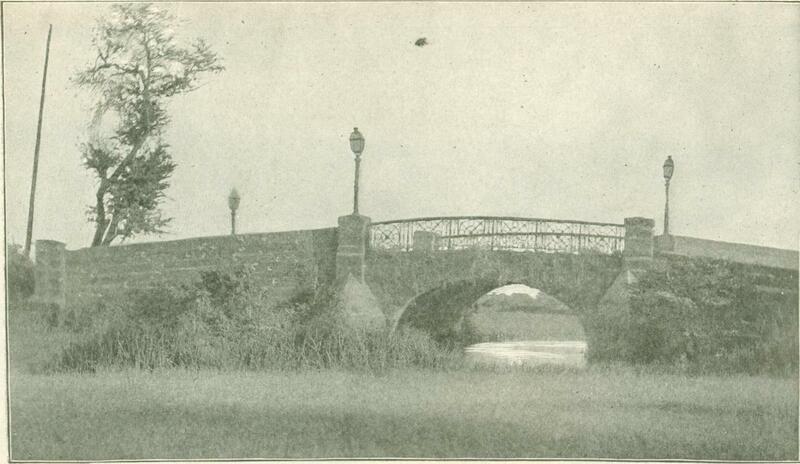 It was in the midst of this hailstorm of lead from the insurg­ent ambush that Gen. King passed over the bridge; three times he deliberately subjected himself to this fire, while his men were well-nigh speechless with amazement. A private who witnessed this su­perb display of courage remarked to an American newspaper correspondent: "That man will never see the United States again." On a shelf in Gen. King's workroom is the worn and battered field-desk which he has carried through his campaigns. In its pigeon-holes is to be found the secret of his marvelous accuracy in writing. A half dozen small blank books of the ordinary commercial kind are filled with entries, written in a minute but legible hand. These record the occurrences of each day of his active, honest service, and present concisely but vividly the impressions made upon his mind at the moment by the stirring scenes through which he has passed. His first work when beginning a new novel is to consult these priceless records. It is doubtful if there is another author who composes more rapidly than Gen. King when once he is inspired by a sympathetic theme. While he emphatically disavows all literary traditions, and declares that his labors in this field are inspired solely by the motive of "making one woman happy" and giving his son and daughters an education which would be impossible by any other means within his command, the strong human in­terests, the swift movement, and the delicate sympathy and tender pathos of his stories are sufficient proof of the fact that his work is done with a genuine heart interest, and not as a perfunctory task. His methods of work are undoubtedly dif­ferent from those of all other authors. After a perusal of his note-books he writes his pages in a short hand of his own and reads his stories into a phonograph which is passed to an operator of the typewriter, who transcribes the record of the cylinder. The sheets are then returned to Gen. King for revision, but the dictated manuscript is sel­dom changed to any great extent. "Between the Lines" and the "General's Double" are Gen. King's favorites of the scores of stories which he has given to the public. His first story was "Kittie's Con­quest," and was written in the '70s. Its production was then regarded by its author as a passing whim, a pastime to relieve the monotony of an officer's life of a frontier post. This was published in the United Service Magazine of Philadelphia, and im­mediately attracted favorable attention. The manuscript was carried in the officer's lug­gage through the Nez Perces and the Sioux campaigns, and shared the fate of many an­other first literary effort in being respect­fully declined by one or two editors. This initial story was followed in 1881 by the stirring romance first called "Winning His Spurs," but later issued in book-form as "The Colonel's Daughter." Then Mr. Alden, the venerable editor of Harpers' Magazine, reached out for the work of the young mili­tary novelist and secured the charming stories, "A War-Time Wooing" and "Be­tween the Lines." The most recent novel from the pen of Gen. King is in process of building out of the materials which the author secured during his campaign in the Philip­pines. This story will be published serially in AINSLEE'S MAGAZINE, the first installment to appear in the Christmas Number. Know­ing what we do of the dash, charm and vigor of Gen. King's style and constructive methods, it is safe to assume that there is a real treat in store for every reader who likes a good novel and admires a brave sol­dier. It is generally supposed that the originals of nearly all Gen. King's heroes were men of the famous old Fifth Caval­ry, but this may be de­nied on the authority of the author. Only two or three of his heroes were sug­gested by the members of that command. These are to be found in "The Starlight Ranch" and the "Worst Man in the Troop." When called to the war in the Philippines, Gen. King was about to join his wife, son and daughters in Europe. The son Rufus is new fourteen years of age, a bright, manly lad, and the center of his father's ambitions. The daughter Elinor is the third of his children, and a girl of rare beauty and attractiveness. A fitting conclusion to this glimpse of the soldier-novelist and his career is a reference to a communication sent by Major-General Thomas M. Anderson to the Adjutant-Gen­eral of the armies of the United States. This is dated March 1, 1899, and recom­mends the promotion of Brigadier-General Charles King to the rank of Major-General of Volunteers as a reward for energy, brave­ry and efficiency in battle during the en­gagement with the Filipino insurgents, February 5, 1899.